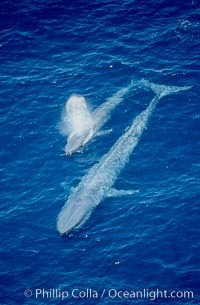 This image shows a blue whale pair likely composed of a mother and calf. Blue whale calves will accompany their mothers for approximately a year before being weaned. Female blue whales are larger than males, an adaptation enabling a mother to cope with the physical demands of calving and nursing.